Definition at line 67 of file TreeEditDistance.h. Definition at line 68 of file TreeEditDistance.h. Node in source tree to be replaced or deleted. Definition at line 69 of file TreeEditDistance.h. 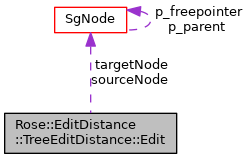 Node in target tree for replacement or insertion. Definition at line 70 of file TreeEditDistance.h. Definition at line 71 of file TreeEditDistance.h.